This week, with regard to our current cold weather, we have lovely dishes that will be welcomed by all our readers who may be shivering. 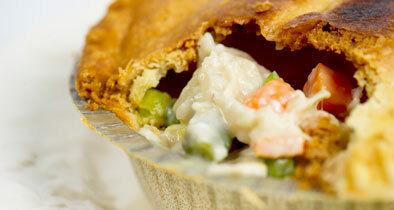 Lillian Cleghorn shares her Chicken Pot Pie through Northside Baptist Church’s cookbook. We appreciate all the wonderful recipes from Northside. From our friends in Plains, Georgia, we have Mrs. Harrison Smith’s Shrimp Jubalai. This may be a different way of spelling Jambalaya. However you spell it, it looks pretty good. Judy Peeler’s Cauliflower Soup looks wonderful. Judy shares it in Feeding the Flock, put out by New Vision’s Community Church. From Paths of Sunshine, Savory Vegetable Casserole looks pleasing and is a welcome hot dish. All the ingredients are frozen or in cans except the mushrooms, which could probably also be from a can if that is the only thing keeping you from running out to the store. This hot bread recipe is wonderful. We appreciate Mary Lee Herro sharing her creation with us through the Apopka Citizen Police Alumni Association’s Sharing Our Finest Cookbook. From First Presbyterian Church of Apopka’s Treasures and Pleasures, Sis Pitman’s Indian Pudding is a wonderfully nostalgic sort of dessert, delicious, and served warm. Robyn Milliken’s Crunch Bars are quick and simple. We appreciate our friends at Northside Baptist Church sharing their cookbook with us. 1 chicken, cooked and cubed. Discard skin and bones. Combine all the ingredients, bring to a boil and place in 9 x 13 baking dish. Mix all ingredients and pour over chicken mixture. Bake at 425 degrees for 45 minutes to an hour, until crust rises and browns. In a large skillet with close-fitting lid, put peanut oil. When hot, add onions and garlic. When onions begin to turn yellow, add 3/4 of the celery, including leaves. Add green pepper and cook over medium heat for 5 minutes, stirring occasionally. Add tomatoes, bay leaves, thyme, chili powder, salt and pepper (to taste). Cover and cook for 10 minutes. Add cleaned shrimp, pimentos, and mushrooms. Cook 7 minutes. Serve over hot rice. In large saucepan, melt butter; add onions, sauté until translucent. Add chicken stock and potatoes. Cover and cook for seven to ten minutes or until tender. Puree potato mixture using blender or food processor. Return mixture to pan. Meanwhile, in another pan, cook cauliflower in water for about seven minutes or until barely tender. Remove one cup florets with slotted spoon and put aside. Puree remaining cauliflower with its cooking water and add it to potatoes. Cut remaining florets into very small pieces and set aside. Add coriander, nutmeg, and pepper to soup. Simmer. Stir in Half and Half, and then add reserved florets. Heat, but DO NOT boil. Garnish with watercress, chives or parsley. Serve. Cook mushrooms and small onion in butter for about five minutes. Add flour, salt and white pepper. Stir thoroughly to blend the seasonings with mushrooms and onion. Stir in milk and cook, stirring constantly, until thickened and smooth. Add cheese, hot pepper sauce and soy sauce. Stir until cheese is melted. Meanwhile, prepare the frozen vegetables as directed. Blend vegetables into cheese mixture. Add water chestnuts, mixing lightly to avoid mashing vegetables. Turn mixture into a buttered 2-quart casserole. Bake at 350 degrees for 10 minutes. Sprinkle crumbled onion rings atop and bake 10 more minutes. Thaw bread. Cut each loaf into thirds. Twist into 16-inch to 24-inch twists. Wrap all twists inside a greased Bundt pan. Let bread rise. Mix remaining ingredients. Spread over raised bread. Bake at 400 degrees for 20 minutes. Stir corn meal, a little at a time, into hot milk and cook in top of double boiler, stirring constantly for 15 minutes or until thick. Remove from heat. Mix together sugar, baking soda, salt, ginger and cinnamon. Then stir into the corn meal mixture. Add molasses and cold milk, mixing thoroughly. Pour into a 1-quart casserole and bake in a preheated 275-degree oven for two hours. Serve warm with whipped cream and a light sprinkling of freshly grated nutmeg. Serves 6 to 8.